Frisch (aka Miss Debbie) appears to be set on repeating teh past. included such choice Debisms as "brutal" "propaganda" "disinformation"
"bullying""disgust" "boycott" "arrogance" and "outrage." 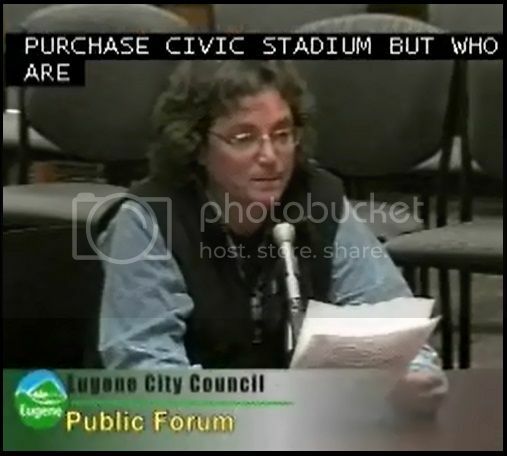 Deb Frisch rants before the Eugene City Council, February 24th. Her rant includes the words, "brutal" "propaganda" "disinformation"
"bullying""disgust" "boycott" "arrogance" and "outrage"
Miss Debbie went on to proclaim a 6 month crusade against the fait accompli. "Let's play ball," she said. February 11th: "Deb Frisch stated [the Federal judge who slapped Deb Frisch with a STFU order in September 2010] recently resigned. She said he violated statutes related to official misconduct. She alleged that the Auditor had failed to provide complete information in the Police Auditor’s annual report in 2011 and 2012, and she questioned whether he would provide complete information in the 2013 annual report. She said a Eugene Police Department (EPD) officer was guilty of misconduct in the second degree and had violated the use of force policy. She encouraged the CRB to encourage Police Auditor Mark [redacted] to obey the law."